I am in mourning. I am mourning the end of one of the most charming love story's I have ever read. This novel has now set the bar so high for love story's that I don't even want to ever attempt another one, knowing that it can't simply be as lovely as Me Before You. I've cried reading books. I've cried A LOT. But, I don't think I have ever wept. While reading this book, there were moments that tears just silently streamed down my face, and I could feel my heart shudder with the emotion. Conversation with me pretty much became useless while I was reading this book. 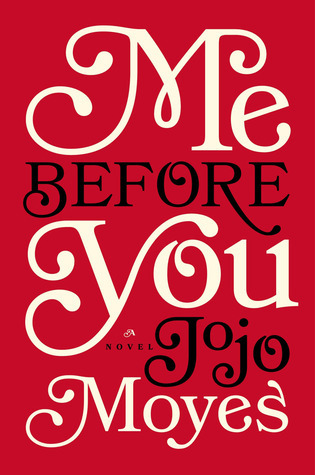 JoJo Moyes did a spectacular job crafting this beautiful story. Lou Clark is a character that has so much whit and charm. I truly laughed out loud many times with her humour and whitty comebacks. I can almost guarantee that you have not read a character that is quite like Louise. She is unique in ever sense of the word. And then, there is William Traynor. A womanizing, adventurous and successful man who has the world in the palm of his hand; Only to have the only world he has even known ripped away from him due to an accident that leaves him a quadriplegic. Of course he is going to be angry, lived even. Of course there are going to be parts of him that are dark and ominous. There is going to be parts of him that are unknown. Shut down. But yet, although he has his moments, he was actually one of the most charming characters. His sarcastic humour will having you breaking into smile throughout the novel. His experiences in life before and after his accident give him a wisdom that a lot of people don't have. Then the story of Lou and William begins. The funny, frustrating, epic story of these 2 characters and You will then experience one of the most beautiful friendship begin. I don't know why I waited so long to read this book. I have seen it flooding the social media sphere ever since it's release, but it was not until I received the paperback for review that I finally read it, and now I will forever be grateful to Penguin Publishing for sending me this one of a kind book! I can't wait until I finally get the chance to read this one! I have it on hold at the library but there are so many people in front of me for it. I've read one of her books and loved it. I'll add this one to my list. I love your blog, and I just wanted to let you know that I nominated you for the Liebster tag award! I hope you don't mind!